This is the largest of the brand’s Flax driver-based 300 Series installation range. 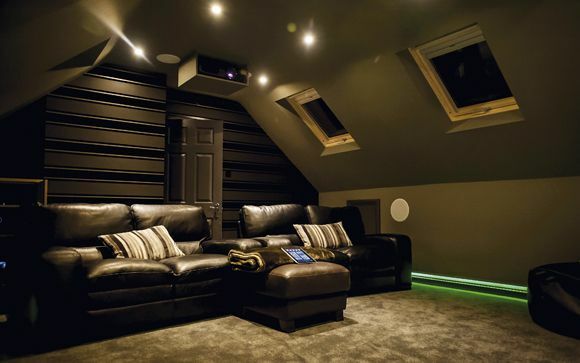 At £400 each – and hence £1,600 to properly top off a Dolby Atmos array – they are patently not a budget solution. That said, in comparison to standalone Atmos upfiring modules, the price isn't extortionate either. This series distils a whole lot of Focal’s Aria series technology into a coaxial, two-way installation speaker. Most obvious is the distinctive buff-coloured driver formed with fibres of natural flax. This makes for a light, rigid cone that also happens to be more eco-friendly than drivers hewn from polypropylene plastic. Complementing the 8in midbass cone is Focal’s 1in inverted dome magnesium-aluminium alloy tweeter, also derived from the Aria lineup. This is mounted on a fixed central pod. Like many coaxial in-ceiling speakers, the Focals have directional tweeter pods to ‘aim’ high-frequency sound. Yet that might not be the best idea in an Atmos setup. The ICW 8’s off-axis performance is incredibly smooth, so leaving them pointing straight down gives the best overall balance at all seating positions. If you do end up right below the speaker, or on-axis to the tweeter, they are going to sound rather bright but Focal has that in hand. An 'HF trim' switch on the rear of the chassis cuts treble by 3dB, giving a much smoother output. The same switch can also boost treble by 3dB for over-dampened rooms or listening a long way off-axis. Ease of installation is a key feature of Focal’s 300 Series, making DIY in-ceiling Atmos about as easy as the project gets. The mounting fame is separate from the driver and is secured into place with four sprung-loaded clamps. You don’t even need a screwdriver. You do have to cut a large hole (264mm in diameter) in your ceiling first though. Focal supplies a cardboard template for this but don’t get confused by the other circular card in the box that offers advice on fitting the clamps. That is 15mm smaller than the actual template. I found that out the hard way, which will teach me to read the manual first. Positioning the hole, you need to ensure the speaker falls between joists with room for the clamps, and that you have the 12.5cm or more mounting depth required for the ICW 8s. If you are using large-diameter speaker cable you'll need to factor this in to your measurements too, as Focal's speaker terminals are at the very rear of the driver chassis. If you have access to the room above, lifting the carpet and floorboards to better see where you are installing the speaker will be worth the effort. Having planned speaker position and cable routing, draw around the template and cut the hole slowly with a dedicated plasterboard handsaw. Go cautiously and you will feel if you hit something other than plasterboard, such as a pipe. There is plenty of tolerance on the size of the hole so don’t worry too much about following the template with millimetre precision. The lightweight frame then slots into the hole and the four clamps push back and inwards to lock it to the ceiling. To comply with current building regulations, now would be the time to install a fire hood in the void above. The speaker's sprung-loaded bare-wire binding posts are fairly easy to connect to when you are up a ladder holding a hefty driver in one hand. The driver then slots into the frame and turns 45 degrees to lock into place. It really is that simple. In each box you will also find a magnetic shield, so you can paint the ceiling without getting emulsion all over your speaker, and two white grilles. One is circular and the other square, the choice being purely cosmetic. Both have a removable felt mask if you want to see the Flax drivers peeking through. With a dozen magnets holding the grilles in place, they are not going to end up on your head during the midst of an Expendables movie marathon. Before getting on to performance, a little explanation on how I actually test in-ceiling and in-wall speakers. The units are installed into a purpose-built false wall and false ceiling, built into the fabric of a wood-framed building. The main wall and ceiling surface used is a fixed ‘baffle’ of plywood; the ply sheets have several large square holes cut out to cater for small single-driver models all the way to huge in-wall subwoofers. Each hole is covered by a larger plywood plate fitted with a rubber gasket to replicate the open backed/sealed baffle environment an install speaker must work in. The cover plates are interchangeable, allowing a mounting hole to be cut in a new plate for each new install speaker. With a single speaker installed I measure impulse and pink noise performance, on-axis and at 15-degree increments off-axis, to get an idea of frequency response. After this, a second speaker in stereo configuration is fitted and I let rip with music and down-mixed movies to get a feel for how they actually sound. Performance wise, here Focal really shakes up the notion that in-ceiling speakers just need to make some noise and be reliable. With stereo music these are very evenly balanced off-axis and deliver a vigorous sound that would give plenty of expensive bookshelf speakers a run for their money. Bass extends usefully down to almost 50Hz (-6dB), ensuring a full-range experience, and the top-end is detailed without being frisky or bright. Lana Del Rey’s Lust for Life CD comes across moody, warm and engaging with plenty of punch on the rap-style tracks. Switching to X-Men: Apocalypse (Blu-ray) down-mixed to stereo, I was so impressed by the sound I decided to hook up the REL HT/1003 for LFE. The partnership was frankly outstanding. Dialogue was crisp and articulate, effects had detail and impact (if not cast around the room) and the sound hung together even at very high volumes. As the roof comes off Sydney Opera House and the bridge explodes, the ICW 8s deliver excitement by the bucket-load. There's a real sense of dynamism, again aided by that full-range delivery. Overall, I think Focal's 300 ICW 8s are superb for the money. They measure well, sound rich but detailed, deliver high SPLs and, thanks to that innovative tool-free clamp, are among the easiest to fit in-ceiling loudspeakers on the market. We say: These sound dynamic and engaging, are easy to install, and will match a wide range of partnering speakers. A little on the large side, but the resulting performance is worth it.